PCD Pharma Franchise in Madhya Pradesh – Starting your own pharma franchise business is a good way of setting a good career and collaborating with top pharmaceutical Company Biofield Pharma. Our Company brings you over 300+ varieties of medicines from different market segments like an antibiotic, antiviral, painkillers, multivitamin, anti-allergic, anti-infective etc for PCD Franchise business. We would like to invite people to business for PCD pharma franchise in Madhya Pradesh. There are open opportunities for all those who seriously intend to start their own business and expansion opportunities are vast. Madhya Pradesh is a good place to start your own medicines franchise business. The state has good demand for quality medicines. Biofield Pharma is the best pharmaceuticals company to bring you PCD pharma franchise in Madhya Pradesh deals. These cover all the prime locations like Indore, Bhopal, Jabalpur, Gwalior, Ujjain etc. Fine quality medicines covering tablets, capsules, injectables, drops, oral suspensions, topical solutions, soft gels etc are offered at most reasonable rates. Attractive promotional tools are offered by the company along with other benefits like incentives schemes, bonus, marketing updates etc. We have fully ensured that you get the best in the market. If you want to connect with our company you can directly call us at +91-9216300566, +91-9216300166 or simply leave an email. You can also have a chat with us or leave a comment in our contact inquiry form. We promise you better deals, good scope and growth opportunities as PCD franchise owners in Madhya Pradesh. The central state of India, Madhya Pradesh is the best place to start your own business and get better profits. The healthcare system is improving with each passing year. The government is taking special care of the healthcare needs and medical facilities availed by the general masses across MP. The state is the largest by area and fifth by population rate. It is a good business destination for all those who want a franchise business. PCD franchise business gives you an opportunity to make your own career in your terms. It is a pharma marketing business that opens doors to endless scope to expansion and profits in different markets of this industry. 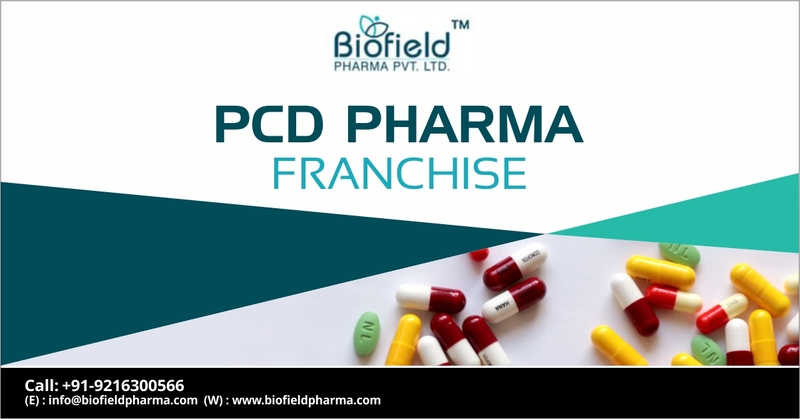 PCD franchise will bring genuine opportunities as one can start PCD franchise at nominal investments at Biofield Pharma. Marketing support is provided by the company. It helps you promote products and enhance your sales number. This helps you garner better returns which turn into profits. MP has wide opportunities for everyone. The pharma industry is growing rapidly and the demand for medicines has grown over the years. There are more coming and soon to be launched by the company. We always look forward to meeting different demands put up by our customers. Different segments like dermatology, nutraceuticals, pediatric, diabetic, cardiology, orthopedic, general range etc. The company has its manufacturing unit established in excise duty-free zone. We have large scale manufacturing unit that is embraced with the latest technology machines. Our skilled staff is dedicated to manufacturing the quality medicines with the optimal use of resources. What Makes Biofield Pharma Better Than Rest of the Pharma Companies in India? Approved range from DCGI and WHO. The good profit margin on sales etc.